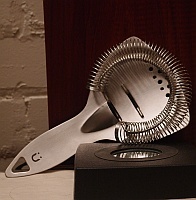 Overview: Branded strainer made for ÜberBarTools. Design shape reminiscent of a stingray – hence the name. Appearance: Stamped from 1.5 mm food grade stainless steel and mirror polished. About 8.5 inches long, 4.1 inches wide. First Impression: Decently made, well fitted/joined and finished parts and edges, good even finish, quite sturdy, nice feel and heft to it. Quality tool. Testing: Large but tightly coiled spring will compress down to fit almost any shaker, glass or pitcher. Large size make it easy to handle and the trademark finger slot makes it easier to hold while straining without slipping. Large triangular notch makes it easy to hang up. No plating to react in a drink, scratch, or wear off – pretty much a forever and low maintenance strainer. Final Thoughts: This strainer is light years in quality beyond most of the cheap tinny crap out there and is a positive joy to use. If you are serious about your bar tools this is the one to get. Stylishly done if a bit light on pictures and information.